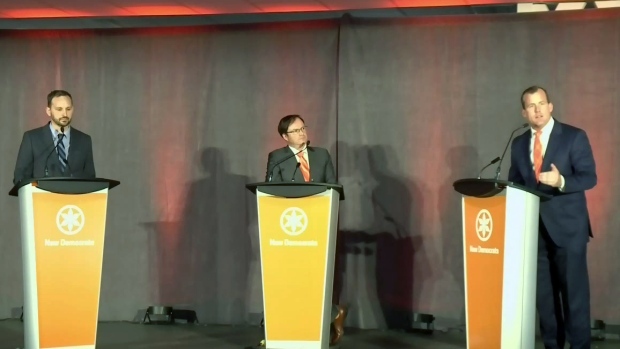 The two NDP leadership hopefuls are squaring off in Regina for the provincial party’s second leadership debate on Wednesday night. It will be a two-horse race between Ryan Meili and Trent Wotherspoon. The deadline to enter as a candidate was last Friday. Before a leader is chosen, the candidates will need to set out their vision for the party. Earlier this month, the pair went head-to-head in Moose Jaw, taking questions from NDP members. Topics in that debate ranged from First Nations educational funding to the sale of the Saskatchewan Transportation Company. Even though it was a debate, Meili and Wotherspoon agreed on many of the questions. Wotherspoon brings more than a decade of experience as an MLA to the race. He served as interim party leader following the provincial election in 2016, but stepped down in June in order to throw his hat in the ring for permanent leadership. Meili was elected for the first time in a byelection in March, but, he has been active in the party for many years. He has run for party leadership twice before. The NDP has two more debates scheduled — one in Lloydminster on Jan. 30 and another in Prince Albert on Feb. 3.